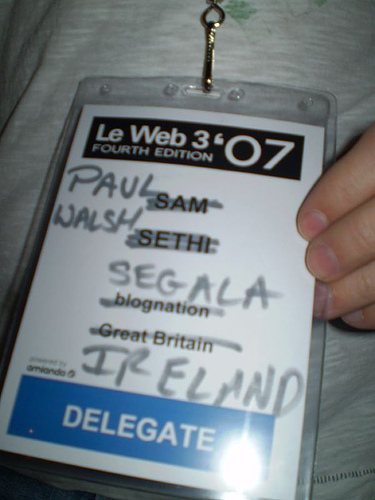 Scam Sethi might be dodging the queries of concerned bloggers at LeWeb3, but his badge made an appearance this year. Not the triumphant return that Sethi dreamed of, I’m sure. I’m already a fan of Pat Phelan after meeting him and interviewing him at TechCrunch 40. But now, he’s helped me find another Irishman to love. Paul Walsh Segala’s CEO – love the badge – love you for thinking to do it. Trust the Irish, indeed! I’m travelling to SF this weekend in order to attend Tech Crunch 40. Would love to meet any mobile companies in the area. If you or your company is interested, I have some time on my calendar Wednesday, September 19th. My contact info is on the About page or you can leave a comment here.